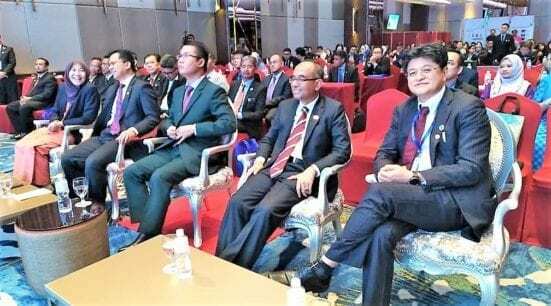 ICLCA 2018 Officiation by Johor State Chairman of Local Government, Science and Technology, YB Tuan Tan Hong Pin (seated centre); accompanied by MBJB Mayor, YBhg Tn Hj Amran A Rahim (seated second from left); UTM Vice Chancellor, YBhg Prof Datuk Ir Dr Wahid Omar (seated second from right) and UTM-LCARC Director, YBrs Prof TPr Dr Ho Chin Siong (seated right). 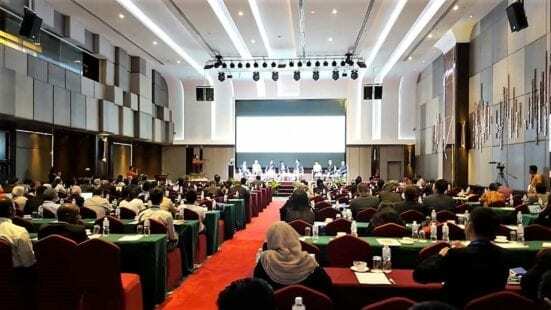 Johor Bahru – A total of 126 climate, cities and sustainable development experts, 73 (58%) of whom were international experts from 17 countries spanning Africa, Europe, Asia, Australia and South America, participated in the 4th International Conference on Low Carbon Asia and Beyond (ICLCA 2018) held at Johor Bahru from 24 to 26 October 2018 to discuss the crucial issues on smart, resilient and sustainable Asian communities. Universiti Teknologi Malaysia (UTM), through the UTM-Low Carbon Asia Research Centre, and the Johor Bahru City Council (MBJB) strategically teamed up with the Iskandar Regional Development Authority (IRDA), the Low Carbon Asia Research Network (LoCARNet), the Institute for Global Environmental Strategies (IGES) and the National Institute for Environmental Studies (NIES), Japan to host this very important event. 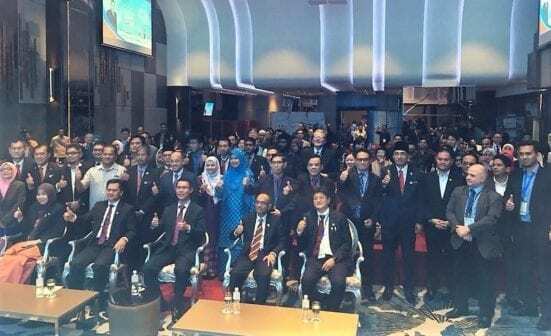 The event was officiated by the Johor State Chairman of Local Authorities, Science and Technology, Yang Berhormat Mr Tan Hong Pin, representing the Johor Menteri Besar, Yang Amat Berhormat Dato’ Hj Osman Hj Sapian. The conference served as a high-impact platform which brought together researchers and multi-stakeholders from the academia, government and industry to champion the transformation and governance of sustainable low carbon societies (LCS) in Asia and beyond. The Johor Bahru City Mayor, Tuan Hj. Amran A. Rahman in his joint Opening Remark noted that over the years, the conference series have grown to become an important regional and international platform for LCS knowledge sharing and dissemination; research networking and collaboration; business pairing and investment matching; institutional and public-private partnerships; and even for making friends. UTM Vice Chancellor, Prof. Datuk Ir. Dr. Wahid Omar concurred and made a commitment that UTM, a premier research university in Malaysia, and the UTM-LCARC will take the lead in offering the world and Asia high quality human capital, research, innovation and service to humanity, including in the areas of climate change mitigation and adaptation, and thus playing more significant and impactful roles in contributing to a better world and a better Asia. The event featured eight (8) plenary speeches and over 120 full paper presentations under eleven (11) themes that covered key topics and issues related to the current state, challenges, and future policy directions of climate change mitigation and adaptation in Asia. Strictly reviewed and selected papers would be published in the high impact factor Journal of Cleaner Production (JCLEPRO) as well as SCOPUS-indexed Chemical Engineering Transaction (CET) and Journal of Design and Built Environment (JDBE). This is the fourth ICLCA series which were previously held in Johor Bahru (2015), Kuala Lumpur (2016) and Bangkok (2017). 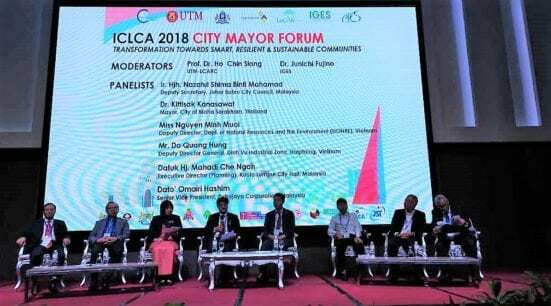 ICLCA 2018 which returned to Johor Bahru scored many firsts, including pre-conference events that comprised an Elsevier workshop on high impact publication on sustainability, a workshop on carbon footprint life cycle analysis and a ProSPER.Net joint meeting; a City Mayor Forum that featured mayor and mayoral representatives from six (6) ASEAN cities; the LCRS/LoCARNet Interim Progress Meeting and the launching of the ICLCA-LoCARNet Johor Bahru Declaration. The fifth ICLCA will be hosted by Ho Chih Minh University of Technology in Ho Chih Minh City, Vietnam from 15 to 17 October, 2019 (http://www.utm.my/iclca/iclca-2019) in collaboration with UTM and IGES, Japan.